This week I took an earful of the new Kanye West/Jay Z record. My curiosity got the better of me and I turned it up in my headphones at work. And the rest of the album is a constant barrage of arrogant, violent, racist and misogynist lyrics. I should have known better, but I was still disappointed. I decided to check in on some of my favorite rappers with Reach Records and discovered this great interview by Justin Taylor (you might remember him from the Makoto Fujimura interview a while back.) Articulate and thoughtful, Lecrae and Trip Lee talk about the craft of hip-hop, how they got into music, how they got to know Jesus, their goals, theology and even race relations. When is the last time you were hugged by a stranger at a concert? These guys are passionate about Jesus Christ. The same Jesus who said “Love your neighbor as yourself,” and “Anyone who wants to be first must be the very last, and the servant of all.” It’s that spirit which prevails at their concerts. 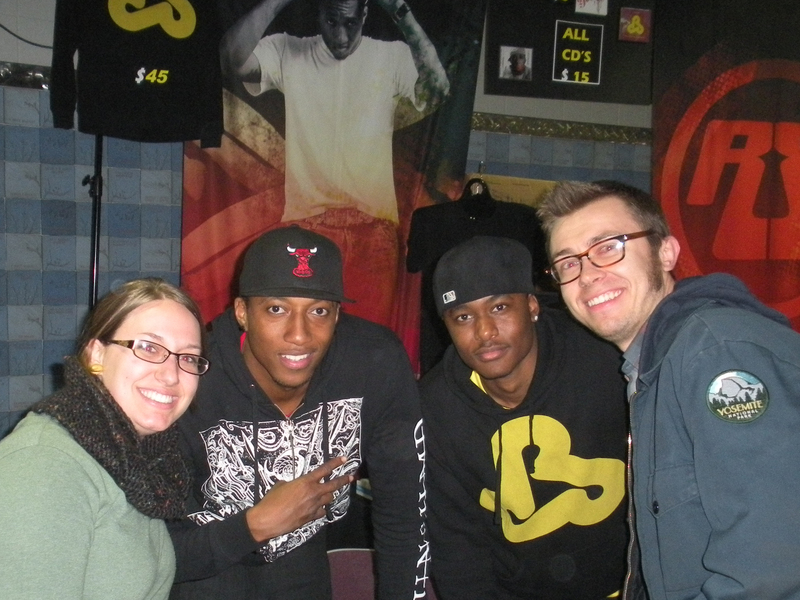 When I went to a Lecrae concert earlier this year, the audience felt like a family. I was dancing my little heart out (I couldn’t help it) and no-one cared that I wasn’t good. The guy next to me was doing the same, afterwards he introduced himself to Liz and me, said something like “great dancing next to you bro” and hugged us. I was stunned. They do art in community. In case you haven’t picked up on this yet, Liz and I get fired up when we see artists working in community. It takes humility to work in community, it’s hard to take criticism, no matter how valuable it is, from friends and peers. The results however, of choosing to work in community, pay off. It’s good business sense for lesser known musical artists to work with one another, play on each other’s records, tour together and pool their collective fan base. (Check out Ten out of Tenn for a similar story in a different genre) And even more than good business sense, I think, it makes better art. People that will push you in your craft, and who love you as a person, are an invaluable resource. The community at Reach Records is inspiring, they invest in one another’s lives on a deep level, both spiritually and artistically. It’s good, well-crafted music. If you haven’t heard Lecrae, Trip Lee, PRo and the other artists with Reach Records go check out their snazzy new website and listen to some samples. So, enough from me, check out the interview! For the source, and a very helpful, topical breakdown of the interview, click here. Also, on a related note, Reach Records artist PRo is about to release a new album called Dying to Live. In honor of that, check out his sweet old-school video game/record promo. You can listen to the album while battling the undead! It can scarcely get better. Watch the Throne (Jay-Z and Kanye’s release) just wasn’t all that impressive. Even aside from the lyrics (which I obviously have many disagreements with), I think the whole thing was just kind of bland. Love the Reach Records crew, though. They have a new project called Man Up coming, which should be good. Also, Pro’s new album is solid. Not perfect, but if you’re a fan of him, you’ll find a lot to love. Yeah J.F. I agree. Even Kanye’s previous album, which I thought was actually really fresh musically, was tough to listen to lyrically. I should know better than to keep hoping for something more profound. Glad to hear you’re a fan of Reach – I (obviously) think they’re doing great work. I haven’t heard about the Man Up project, but I’m going to check it out right now. Here’s my interview with Pro. You can listen in and hear C.E. Moore and myself chat with him. It’s fun, but kind of lengthy. Art show in Colorado Springs this weekend!